How do I tell my alcoholic mother she can't see my kids? "I need help. 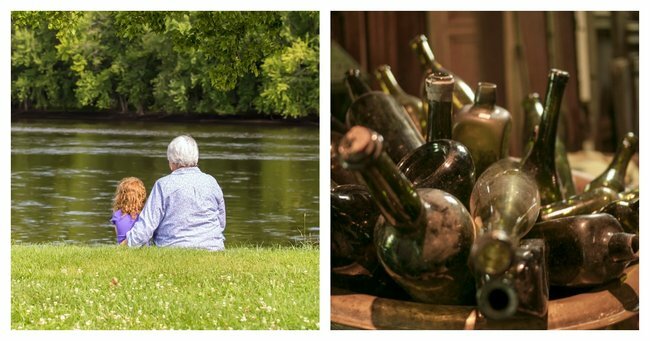 How do I tell my alcoholic mother she can no longer see my kids." I’ve always been envious of parents who can give their child the gift of a magical relationship with their grandparents. Another set of hands to help out, another heart to love them, another person wanting the best that life can offer just the way you do. Sadly though for my kids this is the one thing I’ll never be able to provide. My mother, you see, is an alcoholic. By nature she is selfish, proud and arrogant. My dad left her many years ago. I know she loves me in her own way but our relationship has never been close and truth be told I’ve been holding this together. It is very much a one way street in terms of emotional support. I couldn&apos;t tell you how many times she&apos;s let me down, reliability has never been her strong point. Her words have cut deeper than any knife ever could have and I&apos;ve lost count of the times she&apos;s embarrassed me in front of others. But I hang in there because that&apos;s what you do, right? She&apos;s had tragedy in her life, it&apos;s true, and has battled depression for most of her years. She&apos;s engaged with specialists of every kind but it&apos;s the drink that will kill her. Her daily amount is more than most people&apos;s weekly quota and it&apos;s getting worse by the day. It&apos;s not unusual for her to pour the first drink at around 10 am (because it&apos;s 12pm somewhere, right?) and she&apos;ll generally pass out somewhere early evening. She&apos;s been referred to more rehabs than you could imagine but every time she finds a reason why she can&apos;t go. Forget a regular grandparent offering to babysit, my mother can&apos;t even drive the car to come and get them! She is now at the point where she forgets whole conversations, even days. She will tell me the same story over and over with no understanding that she&apos;s said all the words before. I see her hands tremble as she tries to write, a physical sign of years of abuse. The problem for me though is that when she drinks she gets nasty. Text messages of abuse, suicide threats almost weekly, subtle suggestions that her misery and troubles are all attributed to trying her best to raise me. She adores my children, in her own way. She doesn&apos;t play with them or anything but enjoys seeing them from time to time. She has never had a typical grandparent relationship by any means, more so that she breezes in and sees them playing while whinging about her issues to me. But she says she loves them. This week was the straw that broke the camels back. After yet another abusive phone call I realised that I could no longer shelter my children from her as I had done since they came into the world. There I was, tears streaming down my face after talking her off a cliff once more, only to feel the small hand of my four-year-old daughter on my back. "Mummy, are you crying because Nanna is being mean to you?" How do you explain that? How do you tell a child that the situation is far more complex? Truth be told I get nothing from my mother. The relationship is one guilt and sadness. I know that without me and my children she has nothing but yet the emotional toll she has on my life impacts my own kids and my husband beyond explanation. I know the best thing for me is to cut contact but my loyalty prevents me from doing so because if the day ever came when she followed through with her threats of &apos;ending it&apos;, it would all be because of me. However, as any mother would tell you the day your children are born is the day you stop living for yourself and start living for them. At what point do I decide that the relationship is so toxic that my children should no longer be exposed to it?